► RÉUNION: Air Austral concedes that any A380 delivery would not be in an all-economy configuration. La Réunion-based carrier Air Austral (UU) CEO Marie-Joesph Malé says his carrier will not take delivery of the A380 in an all-economy lay out citing the threat to its premium traffic such a layout would present to the airline's overall viability. ► SOUTH AFRICA: British Airways starts A380 service to Johannesburg from February 2014. British Airways (BA) will, starting 12 February 2014, begin introducing the Airbus A380 aircraft on its London Heathrow – Johannesburg route, where it’ll operate 3 times a week, replacing the Boeing 747-400. ► MAURITIUS: Emirates to deploy A380 to Mauritius from mid December. After the successful one-off operation of the jet to Mauritius earlier in the year, Emirates (EK), will from 16DEC13, introduce the Airbus A380 into service between Dubai and Mauritius route, where it’ll operate 1 of the 2 daily flights, replacing the current Boeing 777-300. In what could be described as the African aviation news story of the year, (that is, if it is proven to be true), Air Zimbabwe (UM) has now announced that it is in talks with undisclosed firms regarding the possible acquisition of an Airbus A380 for use on its pending resumption of flights to London Gatwick. ► MAURITIUS: (Pics) Emirates A380 lands in Mauritius to mark Independence Day. Emirates (EK) today operated a one-off service of its flagship Airbus A380 to Mauritius on the occasion of the island’s 45th anniversary of independence. Flight EK701 from Dubai touched down at Sir Seewoosagur Ramgoolam International Airport at approximately 09h40L. ► MAURITIUS: Emirates to operate one off A380 flight on 12 March. 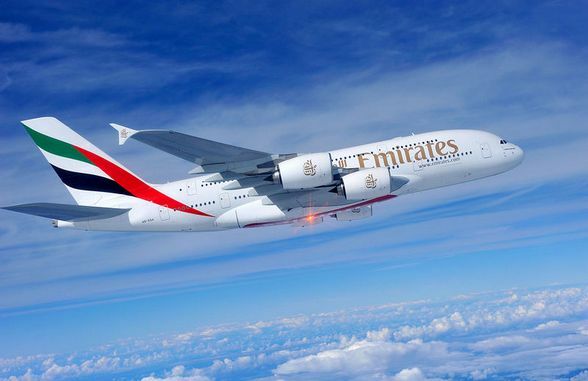 Emirates (EK) today announced it will operate a one-off Airbus A380 service to Port Louis, Mauritius on 12 March to mark the occasion of the 45th Anniversary of Mauritius' independence from Britain. ► RÉUNION: Air Austral boss Malé gives carrier 3 months max to come up with A380 decision. Réunion-based French carrier, Air Austral (UU), is reportedly still in negotiations with European aircraft manufacturer Airbus SAS over a possible deal involving two A380s, albeit, not for the 840-All-Economy-Seaters that were envisaged by previous boss and company founder, Gérard Ethève, prior to his departure from the carrier in April this year. ► SOUTH AFRICA: Emirates cancels intended A380 service return to Johannesburg. As a result of the introduction of a new A380 service to Singapore on a regular basis, the planned A380 service resumption on Dubai – Johannesburg EK761/762 from 01 December 2012, is cancelled. Consequently, Dubai - Johannesburg's service will remain unchanged henceforth (see below). ► SOUTH AFRICA: Emirates again postpones A380's return to Johannesburg over wing crack concerns. [UPDATE 30 AUGUST 2012] Emirates (EK), the Dubai based megacarrier, reports that repairs to the wings of its fleet of Airbus A380s is likely to cost at least USD$100million and will have far reaching consequences on its operations in the months to come. Amongst the routes affected include Dubai - Johannesburg, South Africa, originally scheduled to have its A380 service restarted from 1 October onwards, but due to the aforementioned problems, will now only receive them from 1 December 2012. The cracks issue, discovered earlier this year, resulted from the use of a material known as '7449' that was used in A380 wing rib feet construction. The European Aviation Safety Agency issued an airworthiness directive, extended to all in-service A380s, ordering mandatory inspections of the wing ribs. ►[UPDATE 30 AUGUST 2012] See this post: ► SOUTH AFRICA: Emirates cancels intended A380 service return to Johannesburg. 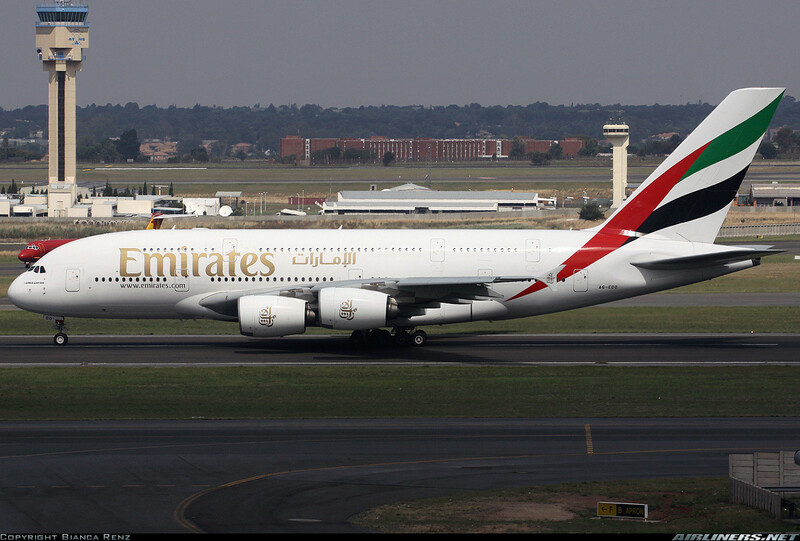 ► SOUTH AFRICA: Emirates adds A380 to Johannesburg for duration of June. Emirates (EK) has issued a slightly revised June schedule for its Dubai - Johannesburg, South Africa service. From 11 June to 24 June 2012 and again on 30 June, EK761 & EK762 will be operated with an Airbus A380, instead of the planned Boeing 777-300ER. As previously reported, the A380 remains on schedule to operate a regular daily service from 1 October 2012. ► SOUTH AFRICA: Emirates to resume A380 Johannesburg service. Emirates (EK) has announced the resumption of Airbus A380 services from Johannesburg to Dubai with effect from 11 June 2012. The aircraft were withdrawn for inspection after Singapore Airlines and Qantas found cracks in their wings in January 2012.